This antenna can be easily installed practically. Thus, modulation reduces the height of the antenna. 2. If the baseband sound signals are transmitted without using the modulation by more than one transmitter, then all the signals will be in the same frequency range i.e. 0 to 20 kHz. Therefore, all the signals get mixed together and a receiver cannot separate them from each other. Hence, if each baseband sound signal is used to modulate a different carrier then they will occupy different slots in the frequency domain (different channels). Thus, modulation avoids mixing of signals. 3. 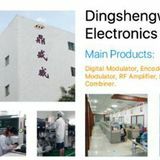 The frequency of baseband signal is low, and the low frequency signals cannot travel long distance when they are transmitted. They get heavily attenuated. The attenuation reduces with increase in frequency of the transmitted signal, and they travel longer distance. The modulation process increases the frequency of the signal to be transmitted. Therefore, it increases the range of communication. 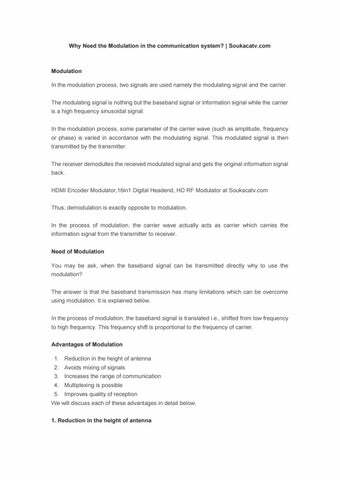 In the modulation process, two signals are used namely the modulating signal and the carrier.